Learn key clinical nursing skills and techniques to care for patients with neurological disorders. Learn more about the function and structure of the central nervous system as well as the symptoms and treatments of the main disorders associated with it by studying the course Nursing Studies - Clinical Skills: Neurological Disorders. The course begins by examining the function of the central nervous system (CNS). You will learn about the structure of the brain and the spinal cord which share a continuous and protective membrane cover called the meninges. You will learn about neurological assessment and how to accurately and completely evaluate the patient's vital signs, mental status, sensory function, motor function, and level of consciousness. 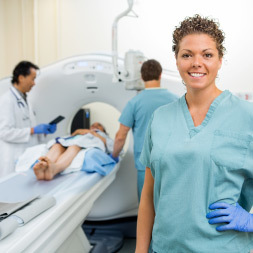 The course then focuses on the various diagnostic procedures used for identifying problems, such as intracranial pressure, tumors, bleeding, and infection. Here you will learn how to identify the various signs and symptoms and to observe and record the a patient's vital signs and level of consciousness. Next you will examine the organs involved in the sensory system such as the eyes and ears which allow us to detect changes in our environment and provide the body with information necessary for homeostasis. You will also learn about these sensory organs are examined and how to administer treatments. Finally, you will learn about the different types of infectious neurological diseases such as meningitis, encephalitis, poliomyelitis acute and Guillain-Barre syndrome. You will learn how to identify the symptoms and differing treatments for each disorder. You will also learn about cranial nerve disorders such as bells palsy, how to identify its symptoms, and make the patient aware of the signs and symptoms as well as the treatment procedures. You will gain insight into degenerative nervous system disorders such as as multiple sclerosis, amyotrophic lateral sclerosis (ALS) and Parkinson's disease, as well as the symptoms and treatments that are available. This nursing course will be of great interest great interest to all health care professionals who would like to learn more about nursing practices and assessment techniques in relation to patient care and treatment of nervous system disorders. Having completed this course you will be able to: - Describe the anatomy of the central nervous system; - Discuss the mechanics of neurological assessments; - Use a standardized neurological assessment scale, such as the Glasgow Coma Scale (GCS); - Describe the different types of diagnostic procedures used to evaluate cranial, spinal and brain injuries; - Discuss the basic principles of unconscious patient care; - Identify, observe and record the patient's vital signs and level of consciousness; - Explain how stimuli affect the sense organs, and how information is sent to the brain through specific cranial nerves; - Discuss how the internal ear provides one of the input systems for general body sense and equilibrium; - Describe the types of Infectious neurological diseases that can render the patient acutely ill; - Explain the different types of cranial nerve disorders; - Discuss the objectives of care for medical and nursing management in relation to seizures associated with cranial disorders; - Describe the main types of degenerative neurological diseases; - Explain the steps to take in medical and nursing management treatment of degenerative neurological diseases.